grizzled, green and yellow fingers. of lineage and my view of my world. Must I turn to Jakuta or Stone? 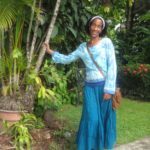 My name is Celia Sorhaindo, a poet born in Dominica, West Indies. I lived many years in the UK and returned home in 2005. I was an organising committee member of the Nature Island Literary Festival and also the Dominica Link for Hands Across the Sea, a US based non-profit organisation which aims to help raise child literacy levels in the Eastern Caribbean. My poems have been published in The Caribbean Writer, Moko Magazine, Interviewing The Caribbean, Susumba’s Book Bag and the New Daughters of Africa anthology. A poem of mine was also long-listed for the UK National Poetry Competition 2017/18. I am a 2016 Cropper Foundation Creative Writers Workshop fellow, a Callaloo Creative Writing Workshop 2017 fellow and am currently finalizing my first poetry collection.